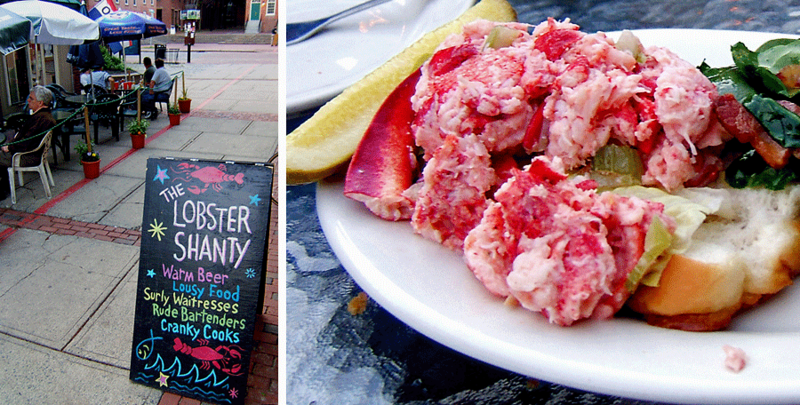 After running some early evening errands in Salem on Friday, we passed the Lobster Shanty and decided to stop for a bite. A local dive bar lauded by Yelp-ers as the best place around to get drunk with your dog, the Shanty advertises “warm beer, lousy food, surly waitresses, rude bartenders and cranky cooks.” How could we not investigate? The place is one of the tiny buildings in Artist’s Row, so the actual bar is relatively small, but what draws locals on summer nights is the good-sized patio area with free live music on weekends. We opted to sit outside and perused the very reasonable drinks menu, choosing a Belfast Bay Lobster Ale ($4.25) and a specialty cocktail, The Perfect Storm ($7.50), that turned out to be a tasty rum punch with a nice kick. Along with the requisite boiled lobster and fried seafood offerings, the menu provides a wide range of choices, including grilled pizzas ($7-$9), gourmet burgers ($7-$10), and entrees ($13-$20) We got a chance to chat with executive chef Diane Wolf, who co-owns the Shanty with her husband, Lee. When they bought the place two years ago from the previous owner, she told us the menu was very limited, and she couldn’t resist having a little fun with it. So while it boasts about limp salads and the tepid sodas, The Shanty’s menu actually reflects creativity and quality not found in your standard pub food; a burger dredged in sesame seeds and cracked black pepper and topped with gorgonzola, grass-fed Guinness-soaked steak tips, and side dishes like wilted spinach and bacon and grilled seasonal veggies. All of the seafood is bought from local fishermen, and Wolf said they make their own mozzarella. We ordered the calamari ($10) to start, the lobster roll ($17) with a side of the spinach and bacon, and a fishwich ($7) with sweet potato fries and an extra side of pickled beets. The teenaged member of our party ordered the chicken tenders and fries basket. The calamari was terrific, lightly breaded and very tender. Our only disappointment was that it wasn’t a larger portion—we inhaled it in short order. The chicken basket was pub standard, but the fries were salted with what looked like sea salt, a nice touch. The lobster roll was what a lobster roll should be: chock full of meat, not overly dressed or seasoned, served on a toasted hot dog bun (we’re sticklers on that point). 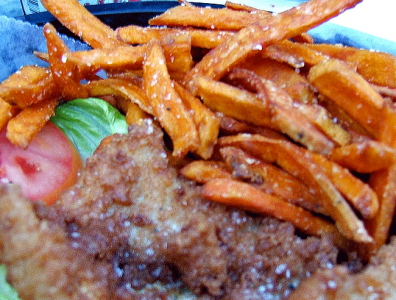 The piece of fish in the sandwich was good-sized, lightly breaded, and crisp. Our server, a smiling young man who answered to the name of Betty (!? ), forgot the tartar sauce but was highly apologetic about it. The spinach and bacon was lovely, and the sweet potato fries were divine. Delicious and crispy with large flakes of salt, we would return on their merit alone. In truth, there are many reasons to return to The Shanty. Yes, it’s a small unassuming place with some surly looking characters haunting the kitchen, but we found the staff genial, the food tasty, and the prices excellent. (Wolf told us that with an eye to the current economy, they’re staying with last year’s prices). With outdoor seating, music on weekends, inexpensive drinks and snacks as well as the more gourmet options, we’re thinking it’s a great place to chill on a summer night. Whether or not you bring your dog is up to you.